The GC0618-1-SC model is an improved product based on the original Highlead GC 0618 and is specially designed for use on medium/heavy weight fabrics and leather. 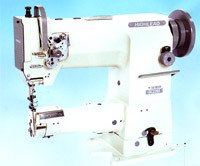 With its powerful feeding system, wider presser foot stroke, higher foot lift and longer stitch length, this industrial machine can deal with many different types of material and thick sewing threads. It has a large hook & base for increased lower bobbin thread capacity and Compound feeding by lower feed dog, needle bar and walking presser foot. 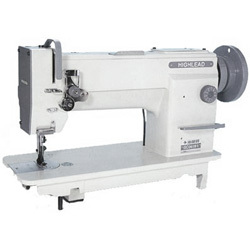 The Highlead GC0618-1-SC: is a general purpose needle feed, walking foot sewing machine for use onmany items includeing: bags, luggage, sofa cushions, horse blankets, canvas, covers, plastic/rubber materials, general upholstery & leather work etc. This Is The Two Needle Compound Feed Version Of The GC20618 Series. An Automatically Lubricated Machine - It Uses Two Large Vertical Axis Rotating Hooks And A Sliding Bar Thread Take Up To Form Crisp Stitches. Needle Bearings For The Arm Shaft And Hook Shaft Together With The Drive Belt And Plunger Pump Mechanism Help To Create Smooth And Quiet Operation. A Safety Clutch Is Standard To Help Prevent Hook Damage. It Is Used Extensively In The Manufacture Of Car Seat Cushions, Safety Belts, Air Bags, Tents And Parachutes.